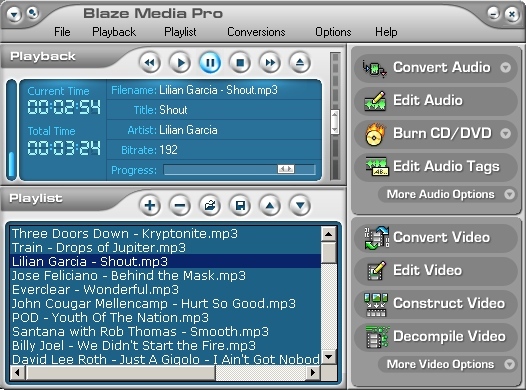 Blaze Media Pro Powerful all-in-one audio and video converter burner editor ripper and more. O in short: Powerhouse all-in-one audio and video converter for CD MP3 WAV WMA OGG MPEG-1 MPEG-2 AVI WMV MOV Flash (SWF and FLV) iPod PSP 3GP etc. ; editor; recorder; CD/DVD ripper; audio video data CD/DVD burner for DVD VCD and SVCD; and more. See above information and user's reviews about Blaze Media Pro Powerful all-in-one audio and video converter burner editor ripper and more.